After more than 200 years of operation, yesterday JPMorgan Chase became an admitted felon. That action for foreign currency rigging came less than two years after the bank was charged with two felony counts and given a deferred prosecution agreement for aiding and abetting Bernie Madoff in the largest Ponzi fraud in history. The felony counts came amid three years of non-stop charges against JPMorgan Chase for unthinkable frauds: from rigging electric markets to ripping off veterans to charging credit card customers for fictitious credit monitoring and manipulating the Libor interest rate benchmark. Dimon is, if nothing else, a master of the grand illusion. Attempting to foster the illusion that there was simply one bad apple behind JPMorgan having to finally plead guilty to a felony is not only an insult to the public, it flies in the face of five regulators’ findings in the matter. 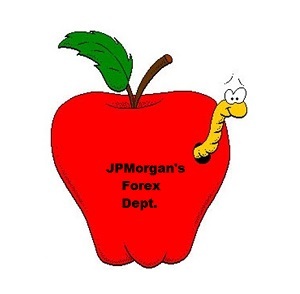 JPMorgan’s involvement in the rigging of foreign currency has now been looked at by the Commodity Futures Trading Commission (CFTC), the Office of the Comptroller of the Currency (OCC), the U.S. Justice Department, the Federal Reserve, and the U.K.’s Financial Conduct Authority. Not one of these regulators alluded to the problem as being one bad apple. Not only was the supervisor of Foreign Exchange at JPMorgan not fired, but as we reported last week, that individual, Troy Rohrbaugh, who has been head of Foreign Exchange at JPMorgan since 2005, is now serving in the dual role as Chair of the Foreign Exchange Committee at the New York Fed, helping his regulator establish best practices in foreign exchange trading. As of December 31, 2014, the commercial bank of JPMorgan Chase held $1.4 trillion in domestic and foreign deposits and $2.074 trillion in assets, making it the largest bank by assets in the United States. On February 12, the U.S. Treasury’s Office of Financial Research (OFR), released a study of the banks that posed the greatest systemic risk to the global financial system. Using systemic risk scores that evaluated size, interconnectedness, substitutability, complexity, and cross-jurisdictional activities, JPMorgan came in with the most dangerous score of 5.05 for U.S. mega banks. And here’s the scariest part of the OFR study: it didn’t evaluate criminal recidivist behavior. What would JPMorgan’s score have been if that aspect had been factored in? Yesterday’s sobering actions by the U.S. Justice Department will be meaningless unless Congress wakes up and breaks up Wall Street’s behemoth banks by restoring the Glass-Steagall Act.